For 46 years, WCSG has impacted thousands of lives by broadcasting the hope found in Jesus Christ. The time has come for us to grow and further that impact. WCSG has acquired a modest building just a quarter mile from our present studios. 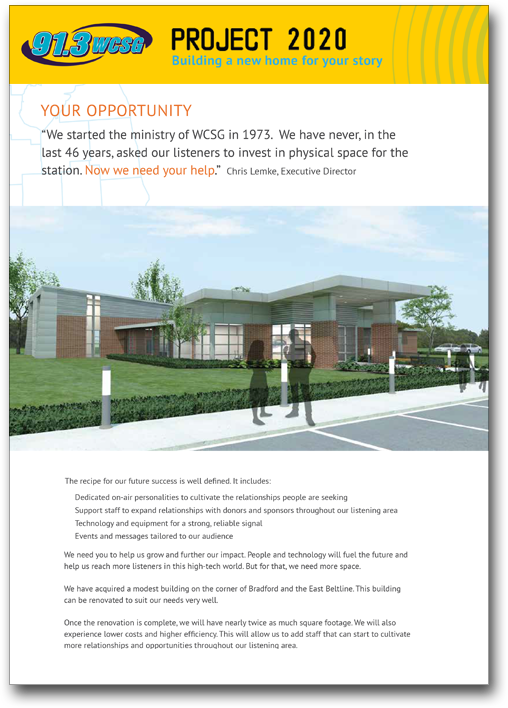 The building can be renovated to suit our needs and give us nearly twice as much square footage. We're asking you to join us in completing this project. Almost 80% of the construction cost has already been committed through private donors, foundations and partnering businesses. Can you help us finish this project? Thank you for your generous gift to help build a new home for your story. We are stronger together than we can ever be apart!